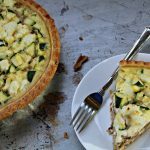 This zucchini quiche recipe is savory and filling. 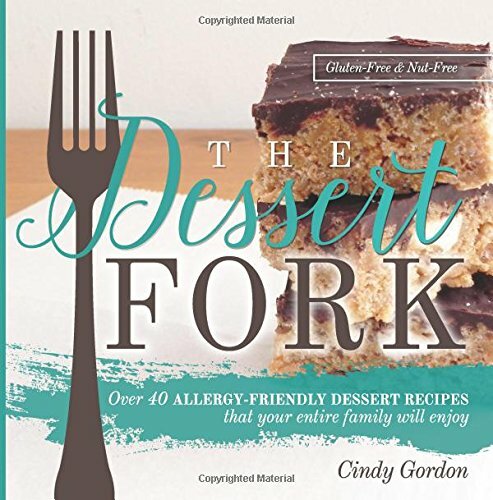 It is easy to make, the hardest part is waiting for it to bake! No need to search the web for the best zucchini quiche recipe. Why? Well because I have THE best zucchini quiche served up for you today. That is right, this delicious and savory recipe can be yours! Just scroll down! 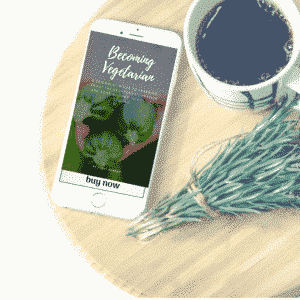 If you’ve been following along on our site for a while, you might have noticed that my love for quiche recipes has grown tremendously! Thankfully, we all benefit from that! Right? After I found these delicious pie shells from The Maine Pie Company my heart was set a fire for gluten-free quiche! 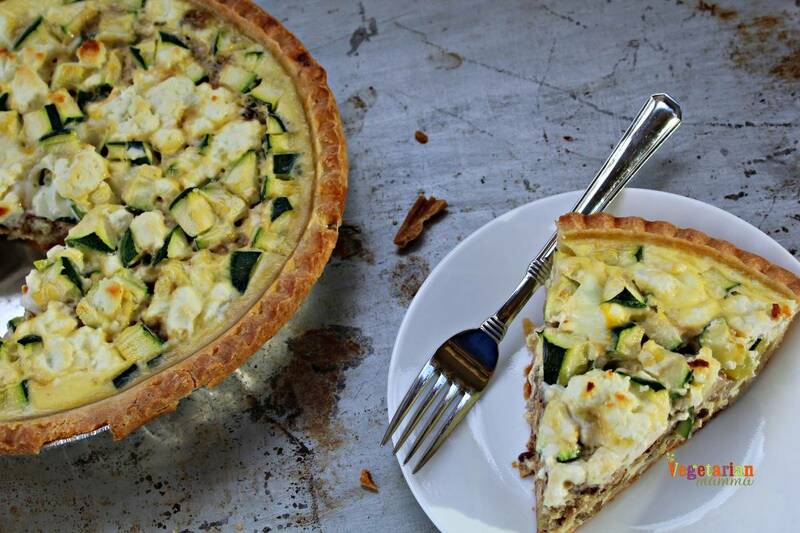 When you hear the words: Savory Zucchini Quiche, what do you think? 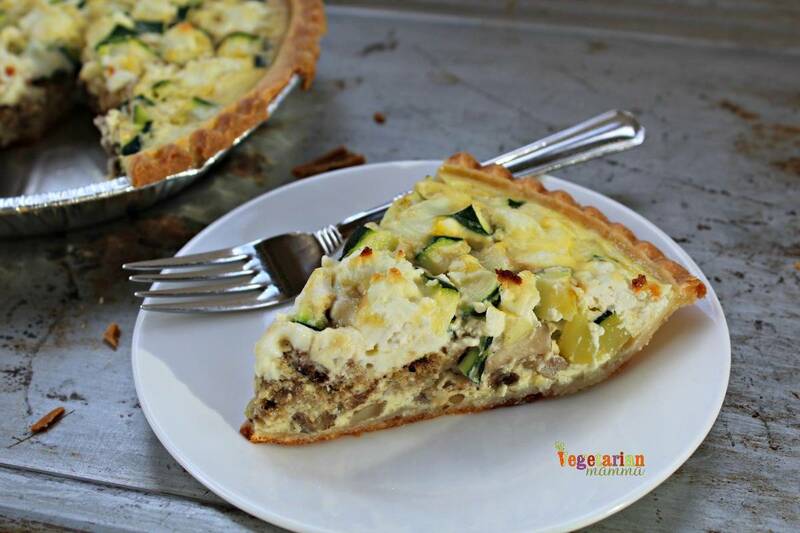 Do you think zucchini mushroom quiche? Or maybe zucchini cheese quiche or maybe zucchini tomato quiche? In this recipe, we used a vegan sausage. If you eat pork sausage feel free to sub that into this recipe! Make it work for you! I used gluten-free pie shells from The Maine Pie Company. Here is a picture that they provided of their new packaging. The picture is the property of The Maine Pie Company and not taken by Vegetarian Mamma. 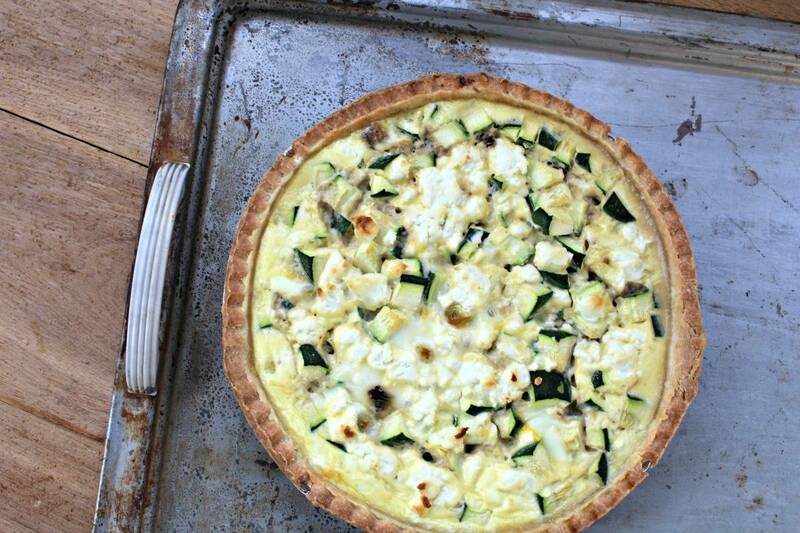 This easy zucchini quiche is going to win your heart over, I promise! Start by adding the mushrooms into your pie shell. Next up is the sausage of your choice! Then layer in the beautiful zucchini! Finish up with the liquid mixture and goat cheese! The goat cheese adds a delicious powerful flavor that will make your tastebuds dance with joy! We love savory zucchini dishes but we also love sweet! 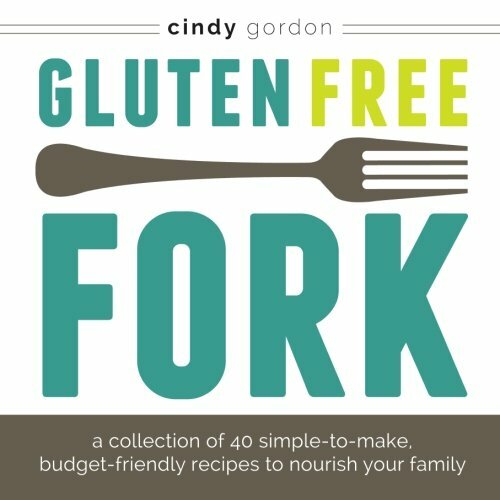 If you are in the mood for a sweet one I would suggest checking our Meaningful Eats Gluten Free Zucchini Bread Recipe! YUM! 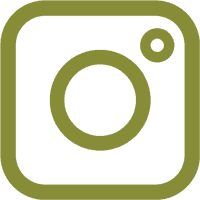 If you love zucchini, check out our other zucchini recipes: Zucchini Corn Cakes, Southwest Zucchini Casserole, Zucchini Bake and Zucchini Grinders. The goat cheese elevates this quiche to the ultimate savory level! Place pie shell on a lipped baking sheet. Preheat oven to 350 degrees F.
In the bottom of the pie shell, gently place mushrooms. Layer in your cooked sausage followed by diced zucchini. Whisk together the eggs, milk and sour cream. Pour into crust. When you remove the quiche from the oven, it may look a bit watery. Don't worry! Let it sit for 5 minutes and the moisture will absorb! As with all the quiche recipes that we repost, this one reheats well. I am always sad when I eat that last piece of quiche! I want it to multiple right before my eyes, so I can have more! The pie shell is an amazing part of this quiche. It has an amazing butter undertone and flaky crust. I am so in love with The Maine Pie Company and I know you will be too. They ship now! Be sure to stock up on your pie shells, pies and tarts for the holiday season! Shop early! Thank you to The Maine Pie Company for sponsoring this post. 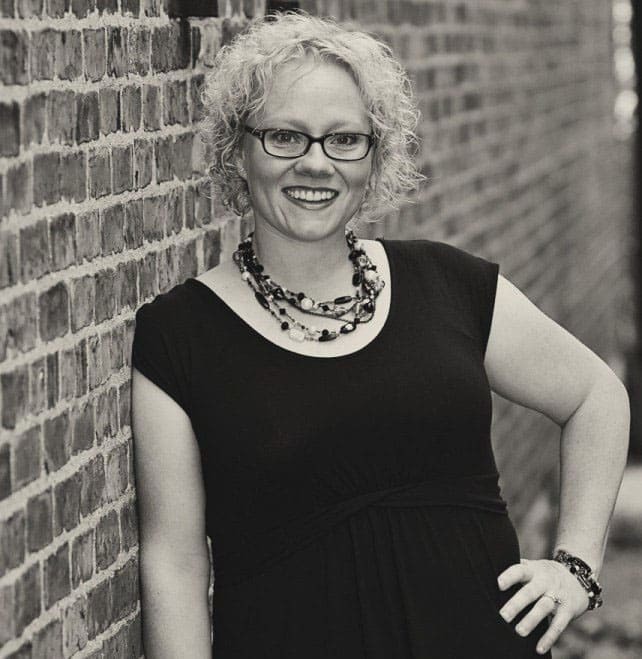 You are amazing to work with and make even more amazing products! Let’s talk! Have you tried quiche? 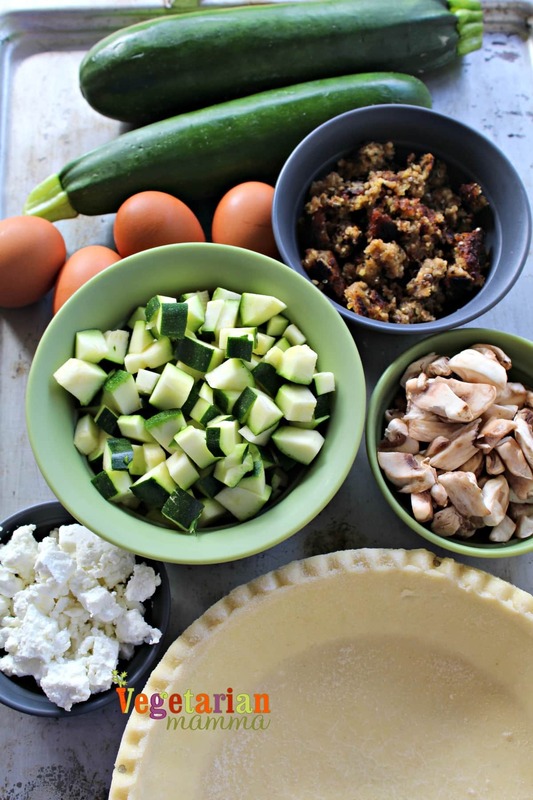 What do you like to put into your quiche? Have you tried zucchini in quiche yet? Oh my goodness, this looks delicious! The photos are making me drool. LOVE! Thank you so much Keeley! You warmed my heart! It is delicious and we work so hard with our photos. I appreciate that! Have yet to try a zucchini quiche. I agree, pie crusts are the way to go, especially for breakfast! Thanks Matt! Yes the pie shells help tremendously especially when you are preparing a quiche! Sounds delicious! I love veggies in a quiche. Of course, I’ll use your filling recipe and my pie crust recipe to make this. Yes, we all have to find what works best for us, that is for sure. We have loved being able to use this pie shell for our gluten-free restrictions. I am a huge veggies in quiche fan just like yourself! Thanks for stopping by and for the comment love! You are great! Would love making crustless quiche with zuchinni. Even better when there is a ton of feta on it. Yes the addition of goat cheese on this particular recipe is delicious. I should try one with feta cheese, thanks for the suggestion. This sounds yummy! Quiche is such a great addition to Sunday breakfast/brunch!! I could eat this for breakfast, lunch or dinner. Loving the addition of sausage. I am with you! It works for everything! 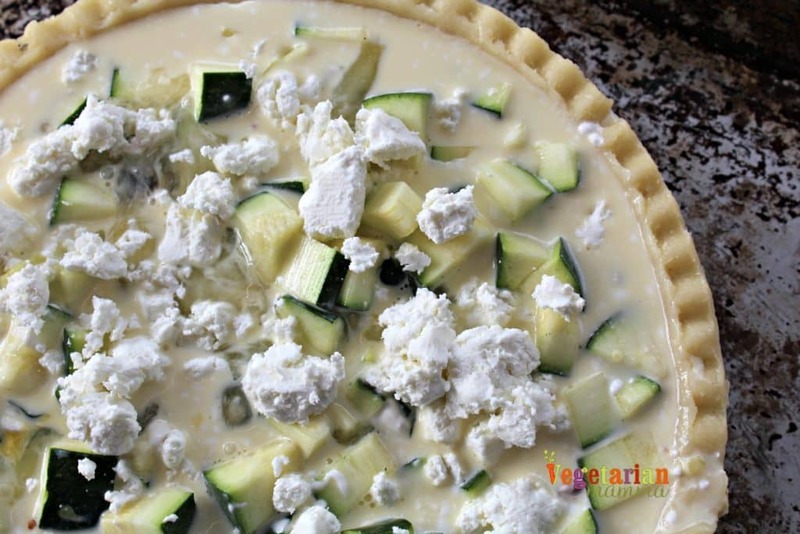 You have some of my favorite foods, mushrooms, goat cheese, and zucchini in this recipe. I can’t wait to make this for a weekend breakfast. Glad it has all the yummies that you love! Enjoy! This looks delicious! The word “savory” alone got me 🙂 I added this to my list of new recipes to try! Fantastic, I hope you love it as much as we do! Um, you had me at zucchini. We are not vegetarians but I try to make one vegie dish a week. This one sounds great! Perfect! I hope that you enjoy!